Every year a group of Royal Ulster Riflemen from Newtownabbey make the near 500 mile, 17 hour trek by both air and sea to the beaches of Normandy in Northern France. For most of them, it is a memorable and meaningful trip to make annually, but for one in particular it means a whole lot more. William ‘Billy’ McConnell MBE served with the 1st Battalion Royal Ulster Rifles on D-Day, and even at the ripe old age of 90 he makes the trip every summer to pay respect to his comrades, most of whom were his friends. He flew into Normandy at the age of 19 on the evening of 6th June 1944 with the 6th Airborne Division as part of Operation Mallard, and he played a major part in the liberation of Longueval and Ranville in the days immediately following their landing. 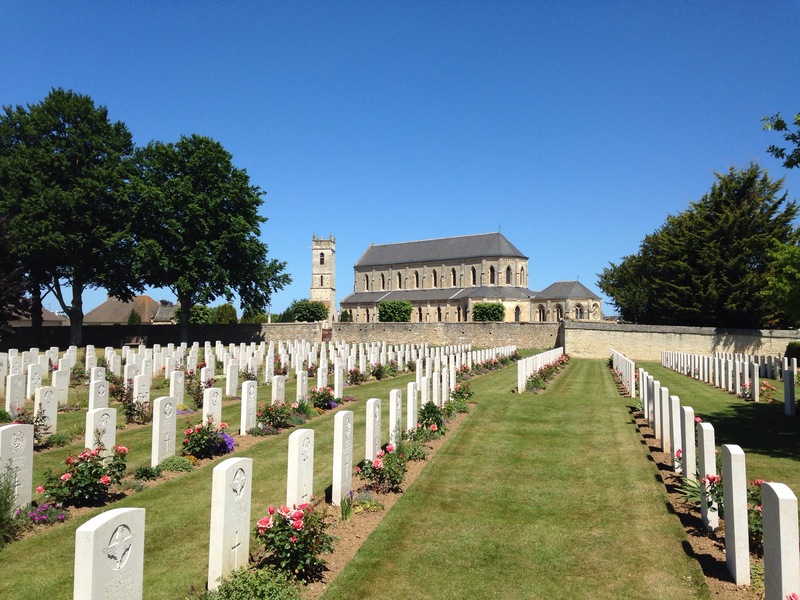 Ranville War Cemetery with the church in the background. Bullet holes are still visible on the church, bell tower, and the surrounding walls. One of his most memorable and fascinating stories, is that of the battle in the village of Ranville. It is a beautiful place, with a church and bell tower dominating the village skyline, and a large war cemetery with over 2000 graves, the majority of which are soldiers from the 6th Airborne Division. While walking through the village, a German sniper opened fire on Billy’s battalion from the bell tower of the church. The the Luftwaffe soldier to took out a Royal Ulster Rifleman before being taken out himself. This scenario unfolded all throughout the Battle of Normandy, most notably in the American sector which was then portrayed in the movie Saving Private Ryan. The thing that makes Billy’s story special though is that he was the one who took out the Nazi soldier, quite the feat considering he didn’t have a sniper rifle to do so. The four RUR men were laid to rest, not in the war cemetery next to the church, but in the church graveyard itself. Buried alongside them is the German soldier whose name is still unknown to this day. Every year Billy returns to that churchyard and places memorial crosses at the graves of his friends. He then places a cross at the grave of the German soldier. This draws a lot of questions from bystanders, but his reasoning is simple and admirable. The German soldier was just doing his job, defending his country for a better life for his family. Billy and his comrades were doing exactly the same. And for that reason he remembers the German soldier knowing that as there is no name on the grave, his family more than likely never found out where he died, or where he was buried. Billy fought in Normandy until September when he was sent back to England before going to Belgium that winter to halt the German offensive in the Ardennes. He then went on to cross the Rhine in 1945 where he suffered shrapnel wounds. Billy eventually rose to the ranks of RSM before leaving the army in 1969. The Royal Ulster Rifles were the only regiment in the British Army to have two battalions sent into Normandy in Operation Overlord, and when Billy returned to Normandy for the first time on the 50th anniversary of D-Day in 1994 he was shocked to see there were no lasting monuments to either of these units. He set out single handedly to change this, and for the cost of a bottle of Bushmills whiskey in exchange for some land from a local farmer, and a trip to France for a Ballymena stonemason, he had erected two beautiful monuments to both the 1st battalion (Longueval) and 2nd battalion (Cambes en Plaine). This was my second annual trip to Normandy in the presence of Mr McConnell, and I have already started planing flights from Berlin to Paris and a train on to Caen next June for next years visit! Previous Post Ich bin ein Berliner!